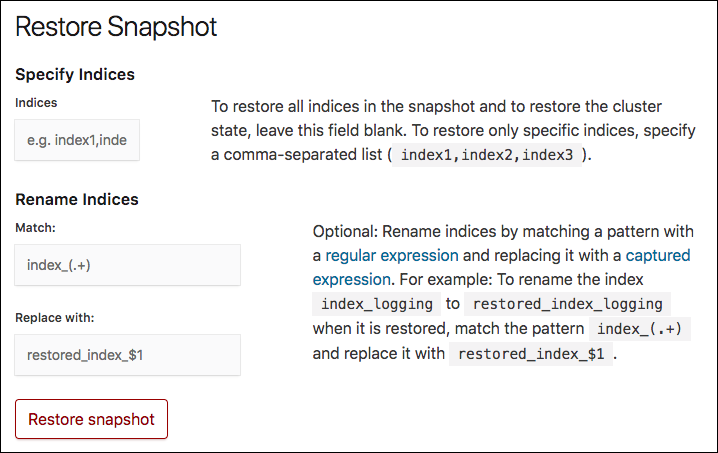 Snapshots provide a way to restore your Elasticsearch indices. They can be used copy indices for testing, to recover from failures or accidental deletions, or to migrate data to other deployments. By default, Elasticsearch Service takes a snapshot of all the indices in your Elasticsearch cluster every 30 minutes. You can set a different snapshot interval, if needed for your environment. The snapshot count can keep anywhere between a minimum of 12 or up to a maximum of the 100 most recent, successful snapshots. You can also take snapshots on demand, without having to wait for the next interval. This will not interrupt your retention schedule, taking a snapshot when you want to just adds an additional snapshot. This might be helpful if you are about to make a deployment change and you don’t have a current snapshot. Log into the Elasticsearch Service Console and select your deployment. Snapshots can be restored to either the same Elasticsearch cluster or to another cluster. If you are restoring all indices to another cluster, you can clone a cluster. Users created using the X-Pack security features or using Shield are not included when you restore across clusters, only data from Elasticsearch indices is restored. If you do want to create a cloned cluster with the same users as your old cluster, you need to recreate the users manually on the new cluster. For most logging and metrics use cases, it is cost prohibitive to have all the data in memory, even if it would provide the best performance for aggregations. Cloning the relevant data to an ad hoc analytics cluster that can be discarded after use is a cost effective way to experiment with your data, without risk to existing clusters used for production. The safest way to check that both your indices and your applications are ready for the next Elasticsearch version is to copy the indices to a new cluster and to test your applications with the new version of Elasticsearch there. It’s what we recommend for major version upgrades. Realistic test data is crucial for uncovering unexpected errors early in the development cycle. What can be more realistic than actual data from a production cluster? Giving your developers access to real production data is a great way to break down silos. Mapping changes almost always require reindexing. Unless your data volume is trivial, reindexing requires time and tweaking the parameters to achieve the best reindexing performance usually takes a little trial and error. While this use case could also be handled by running the scan and scroll query directly against the source cluster, a long lived scroll has the side effect of blocking merges even if the scan query is very light weight. Test your application against a real live Elasticsearch cluster with actual data. If you automate this, you could also aggregate performance metrics from the tests and use those metrics to detect if a change in your application has introduced a performance degradation. The cluster is in the same region. For example, a snapshot made in eu-west-1 cannot be restored to us-east-1 at this point. If you need to restore snapshots across regions, use a custom repository. The destination cluster is able to read the indices. For the time being, this means that a cluster must have an Elasticsearch version that is equal to or higher than the source cluster. First, create a new deployment and in the Restore from snapshot section, select the deployment that you want to restore a snapshot from. The latest successful snapshot from the cluster you selected is restored on the new cluster when you create it. If you don’t know the exact name, you can put in a few characters and then select from the list of matching deployments. Manually recreate users using the X-Pack security features or using Shield on the new cluster. User information is not included when you restore across clusters.